The unrivalled pinnacle of the yachting calendar, the Monaco Yacht Show brings together all the biggest names in the world of yachting to exhibit their newest masterpieces. We round up the most notable new arrivals to keep an eye out for... 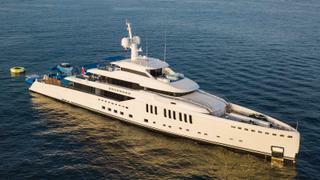 Built to PYC standards, 85 metre Areti is a Winch-designed Lürssen superyacht can accommodate up to 18 guests. Those look to relax on board certainly won't be stuck for options, with a luxurious spa area complete with sauna, hot tub, full depth plunge pool and experience showers. 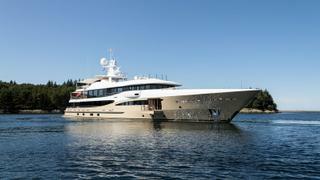 Built to PYC standards, 85 metre Areti is a Winch-designed Lürssen superyacht can accommodate up to 18 guests. Those look to relax on board certainly won't be stuck for options, with a luxurious spa area complete with sauna, hot tub, full depth plunge pool and experience showers. Delivered at the tail end of 2016, the 92 metre Sinot-designed Feadship superyacht Aquarius looks set to dominate the 2017 Monaco Yacht Show. Her light filled lounges are completely devoid of supporting pillars, creating a truly open-plan feel informed by her owner’s experience in the luxury accommodation industry. 2017 is shaping up to be a huge year for Italian yard Rossinavi, with four yacht launches scheduled. The Longitude 49 yacht Aurora is arguably the most exciting of the bunch, with a dynamic exterior design by Fulvio De Simoni, and she will be going on display in Port Hercules this September along with the yard's other recent launch, the 49.9 metre Endeavour II. At 36.45 metres, Clorinda will not be the largest yacht at the Monaco show by any means, but she will be one of the most historically significant. Launched in July 2017, she is the first ISA yacht to be completed since the Ancona yard was bought by the Palumbo Group. As such, she features some subtle hints at the future of the popular ISA Sport 120 range, such as dark tinted glass inserts in the superstructure, a side-loading tender garage and a skylight in the master suite. 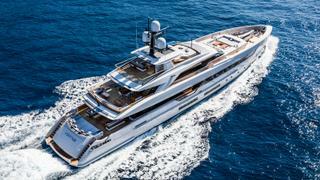 The second largest yacht to date from Italian yard CRN, 74 metre Cloud 9 was delivered earlier this year sporting exterior lines by Zuccon International Project and palatial Winch Design interiors, totalling in excess of 1,000 square metres. Key features include a separate owner’s deck and a beach club with an extendable bathing platform. Parent company Ferretti Group will also be giving a Monaco debut to its updated version of the Custom Line Navetta 33, which is due to be unveiled in Cannes a few weeks prior. 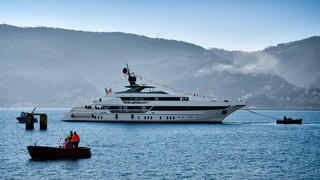 The second largest yacht to date from Italian yard CRN, 74 metre Cloud 9 was delivered earlier this year sporting exterior lines by Zuccon International Project and palatial Winch Design interiors, totalling in excess of 1,000 square metres. Key features include a separate owner’s deck and a beach club with an extendable bathing platform. Parent company Ferretti Group will also be giving a Monaco debut to its updated version of the Custom Line Navetta 33, which is due to be unveiled in Cannes a few weeks prior. The new flagship of the Netherlands’ Mulder Shipyard, Delta One is a 36 metre Claydon Reeves design that makes good use of the fast displacement hull form pioneered by Van Oossanen Naval Architects. 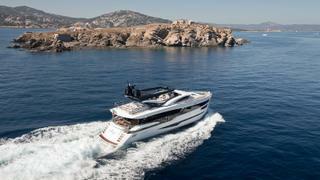 This all-aluminium cruiser boasts a transatlantic maximum range and many other features normally associated with much larger yachts, such as a fold-out terrace in the saloon and a superyacht beach club in the transom. 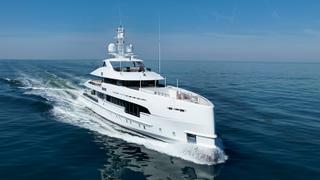 Configurable yacht specialist Dynamiq made a huge impact at last year’s Monaco Yacht Show with the 39 metre Jetsetter, and the yard’s 35 metre follow-up GTT 115 looks every inch as impressive. Studio FA Porsche helped to develop both the exterior styling and the achingly cool interiors, with Pepita houndstooth fabrics similar to those found on the latest Porsche 911 R edition sportscar. An aggressive, slender profile by Studio Bacigalupo reflects the sporty performance of this 49.9 metre from Cerri Cantieri Navali, which hit 27 knots during sea trials. The first boat in the Italian yard’s Fuoriserie line, Elsea features a formal main deck saloon plus a cosy upper saloon primed to host movie nights for all 10 guests. With towering topsides and vivid orange detailing, there’s certainly no mistaking Genesia, the new Ocean King 130 yacht from Italian yard Cantiere Navali Chioggia. Styled inside and out by Andrea Vallicelli and riding on a hull developed by naval architects InNave, this 40.25 metre explorer yacht will have visitors to the Monaco show dreaming of far-flung expeditions. The Gulf Craft Majesty 100 series is new for 2017, and despite measuring 31.68 metres, it is described by the UAE-based yard as an “entry-level superyacht range”. Built to an in-house design, the Majesty 100 is also the first Gulf Craft yacht to feature a skylounge, giving owners the chance to enjoy elevated views out to sea from the comfort of an air-conditioned upper saloon. The first Heesen yacht to combine hybrid propulsion with a fast displacement hull, 49.8 metre Home will be making her debut at Monaco this year. Italian design Cristiano Gatto created a chic, modern interior for this all aluminium yacht, which perfectly compliments her sleek exterior styling, which comes courtesy of long-time yard collaborator Omega Architects. 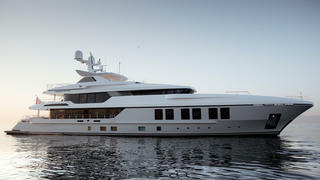 And given Heesen’s reputation for top-notch hospitality, the 4.8 metre long sundeck bar should come in handy during the show. Kalliente is the first hull of Dominator’s Ilumen range. 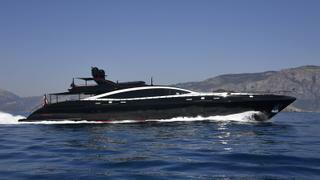 The semi-displacement epoxy carbon boat lives up to its series moniker with floor to ceiling glazing in the saloon and a light-flooded master cabin, all wrapped in muscular lines penned by Alberto Mancini. The latest Amels Limited Editions 180 yacht, Lili gives a good indication of how flexible the Dutch yard’s signature platform really is. Her superyacht sundeck has been extended by three metres to make room for a four metre long counter-current swimming pool. 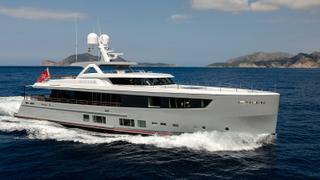 Other customisations include several fold-out balconies and a private aft deck leading off from the owner’s suite. 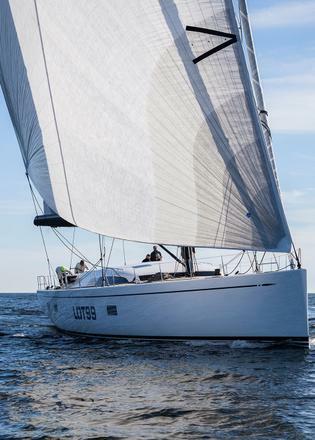 The first Swan 95 is a sailer built for slick performance, with twin rudders for responsiveness and easy manoeuvring, while a lifting keel can shrink her draught from 5.5m to 3.3m. Lot 99 features a semi-raised saloon, but a flush deck version of the 95 is also available. The Mangusta 165 has proven to be one of the most successful semi-custom yacht series in the 50 metre bracket, with the 12th hull launched by Overmarine earlier this year. Her bold exterior colour-scheme immediately sets her apart from all of the other yachts in the series and rumour has it that her interior is just as daring. The Italian yard is also expected to bring a member of its burgeoning Mangusta Oceanco 42 range to the Monaco Yacht Show this year. The Mangusta 165 has proven to be one of the most successful semi-custom yacht series in the 50 metre bracket, with the 12th hull launched by Overmarine earlier this year. Her bold exterior colour-scheme immediately sets her apart from all of the other yachts in the series and rumour has it that her interior is just as daring. 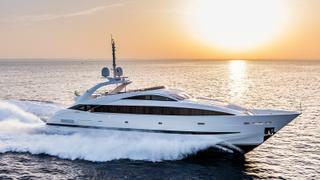 The Italian yard is also expected to bring a member of its burgeoning Mangusta Oceanco 42 range to the Monaco Yacht Show this year. Another Turkish titan hoping to take Monaco by storm, 47.5 metre Nerissa is hull number one in Bilgin’s 156 semi-custom series. 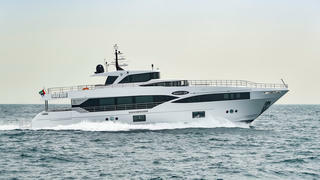 Her curvaceous exterior is straight from the boards of Unique Yacht Design, who also contributed the naval architecture for the project, while British studio H2 Yacht Design worked up her bright, modern interior décor. 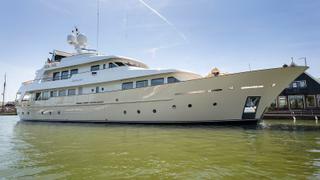 Dutch yard Damen is bringing the newest member of its yacht support vessel fleet to the Monaco show this year. New Frontiers measures 55.3 metres, giving owners a wealth of tender carrying options from helicopters to submersibles and much more besides. What’s more, she has been fitted out with three guest cabins, including a main-deck owner’s cabin, making her ideal for a weekend away from the mothership. Damen will also be bringing the 69.15 metre Game Changer, which turned heads in London earlier this year by mooring up alongside HMS Belfast. 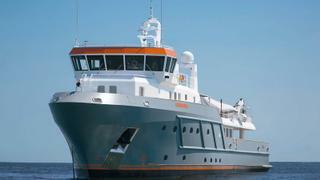 Dutch yard Damen is bringing the newest member of its yacht support vessel fleet to the Monaco show this year. 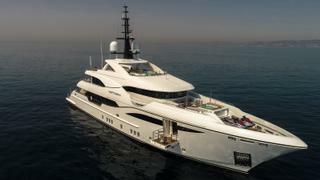 New Frontiers measures 55.3 metres, giving owners a wealth of tender carrying options from helicopters to submersibles and much more besides. What’s more, she has been fitted out with three guest cabins, including a main-deck owner’s cabin, making her ideal for a weekend away from the mothership. Damen will also be bringing the 69.15 metre Game Changer, which turned heads in London earlier this year by mooring up alongside HMS Belfast. 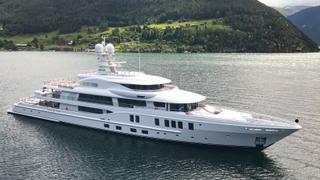 One of 2017’s more secretive launches, 74 metre New Secret slipped into the water at Amels in a manner befitting her name. 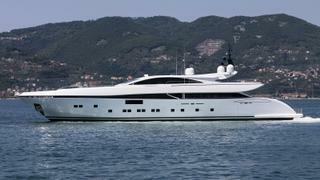 However, her owner has agreed to a slot at the Monaco show, despite the fact that New Secret is not offered for sale or charter. Visits to this Limited Editions 242 yacht will be limited to VIPs only — those lucky enough to get on board can admire her Winch Design interior, which has been described as “warm and tastefully discreet”. 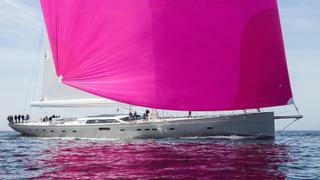 Yard owner Hans Georg Näder has commissioned Baltic for all six of his Pink Gin sailing yachts and the latest installment, Pink Gin VI, pushes the boundaries of sailing design in several key ways. Keep an eye out for multiple balconies cut into her 53.9 metre carbon-fibre hull, as well as her Design Unlimited interior of petrified wood, salmon skin, gilded bronze, hammered copper and velvet. The first yacht in Turquoise’s new generation fleet — and the first hull out of the Turkish yard’s sheds since Ileria in 2013 — Razan’s highlights include sprawling deck spaces, a spectacular beach club and a globe-trotting cruising range of 4,200 nautical miles. Italian yard Benetti is sure to make a big impact in Port Hercules with the 67 metre Seasense, which is notable, not just for her length, but due to the new design collaborations that led to her launch. Dutch designer Cor D Rover provided the exteriors — a first for a Benetti — while Los Angeles design studio Area developed the interiors — a first for any yacht. Sister company Azimut will also be bringing its new Grande 35M and Grande 27M yachts, fresh from their public debut at the 2017 Cannes Yachting Festival just a few weeks earlier. Italian yard Benetti is sure to make a big impact in Port Hercules with the 67 metre Seasense, which is notable, not just for her length, but due to the new design collaborations that led to her launch. 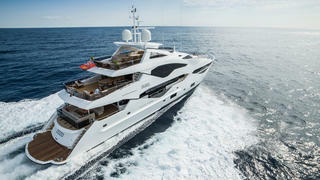 Dutch designer Cor D Rover provided the exteriors — a first for a Benetti — while Los Angeles design studio Area developed the interiors — a first for any yacht. Sister company Azimut will also be bringing its new Grande 35M and Grande 27M yachts, fresh from their public debut at the 2017 Cannes Yachting Festival just a few weeks earlier. 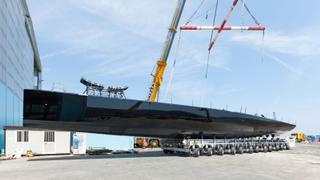 Italian yard Perini Navi has confirmed that it will be bringing a 60 metre sailing yacht to Monaco this year, with reports suggesting that it is the in-build project currently known as C2232, which was recently launched and named Seven. She is the third such yacht to be built by Perini, following on from Seahawk and Perseus 3, all of which benefit from Ron Holland's naval architecture expertise. Hull number one in the Sanlorenzo 52 Steel range, Seven Sins has already been given the red carpet treatment in Monaco as part of her official unveiling last month. Returning to the principality in September, she will be fresh from her maiden season cruising the Mediterranean. 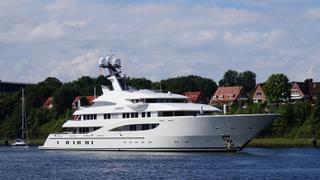 No doubt her Belgian owner will have made good use of her fold-out beach club and aft-deck swimming pool. 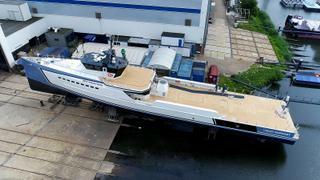 Meanwhile, the 42.2 metre Ocean’s Four and as-yet-unnamed models from the SL118 and SD126 series will also be representing the Italian yard in Port Hercules. Hull number one in the Sanlorenzo 52 Steel range, Seven Sins has already been given the red carpet treatment in Monaco as part of her official unveiling last month. Returning to the principality in September, she will be fresh from her maiden season cruising the Mediterranean. 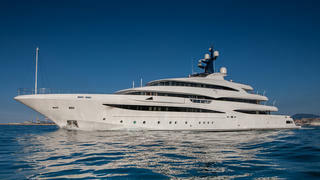 No doubt her Belgian owner will have made good use of her fold-out beach club and aft-deck swimming pool. 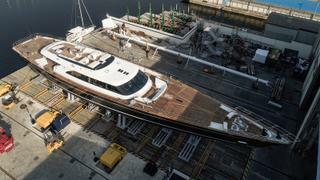 Meanwhile, the 42.2 metre Ocean’s Four and as-yet-unnamed models from the SL118 and SD126 series will also be representing the Italian yard in Port Hercules. Venerable Dutch yard Hakvoort is bringing its newest canoe-sterned beauty to this year’s Monaco Yacht Show. 38.25 metre Soprano hits all the right notes with a interior by Felix Buytendijk that was inspired by New England beach houses. This classically styled aesthetic is truly befitting of her elegant exterior from Diana Yacht Design. 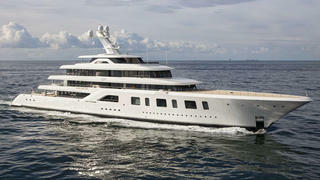 Most of the new yachts going on display at the Monaco Yacht Show have had a relatively short delivery voyage. 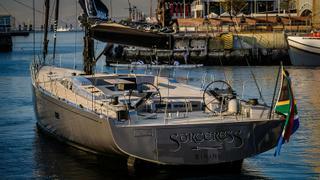 Not so, Sorceress, who will have proved her blue water cruising credentials by making the trip up from South Africa where she was launched in April by the Southern Wind Shipyard. The first model in the limited edition SW96 series, she features naval architecture by Farr Yacht Design as well as styling inside and out by Nauta Design. The priorities of the UK yard, and its clients, are changing, from speed to comfort (although at 25 knots the 131 is still no slouch). 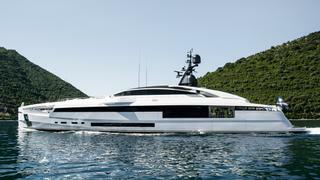 The Sunseeker 131 is based on the 40M and 35M, but with enormous windows and cutaway bulkheads. We don’t yet know which hull will attend the show, but the first launch, Zozo (pictured above), boasts a subtle and restrained interior in American black walnut and Dark Emperador marble. The boat will be joined by a 116 and a 95. Hull number four in the Wallycento series of 30.48 metre sailing superyachts, Tango will be representing the yard at this year’s Monaco show. Developed in collaboration with naval architect Mark Mills and built by Persico Marine, she features interior styling by the renowned Pininfarina studio. Wally adds that this latest model has been optimised for superior performance, with improved hull stiffness, a new deck layout and a lower dry displacement of 47.5 tonnes. Two years after the debut of 69.3 metre Suerte, Italian yard Tankoa Yachts is returning to the Monaco Yacht Show this year to give a public debut to the 49.9 metre Vertige. An on-board cinema and superyacht gym are just two of the highlights that make this Francesco Paszkowski-designed yacht well worth a closer look.